Callie’s owner moved away, taking all of her dogs with her except for one. For some inexplicable reason, she didn’t want to take Callie. 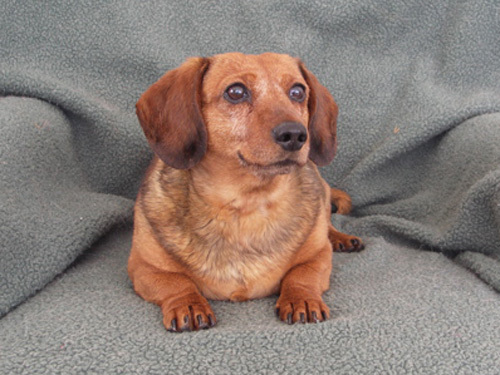 Instead, she gave this blind Dachshund to a friend who as it turned out didn’t want a dog in the first place. Within a couple of days the friend took Callie to the Bitterroot Humane Association, and that’s when the shelter called us. Callie turned out to be an incredibly sweet, gentle little soul. She’s completely blind, but somehow she can always find what she wants. Especially any source of food. And food, as we all know, is a great motivator. One evening we heard the sound of something being dragged in the living room. We came out to see Callie dragging a 40-pound bag of dog food across the floor. She had the corner of the bag in her mouth and was pulling with all her might. We think Callie was intending to hide the bag in a corner, chew her way into it, and have a private feast. As you can see from the photos, Callie is already a plump girl. There might be a reason. 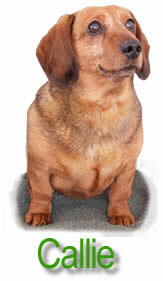 If we hear the odd sounds of a small, overweight Dachshund trying to jump up? not make it? and jump again? we know Callie is frustrated and can’t get onto her towel perch. 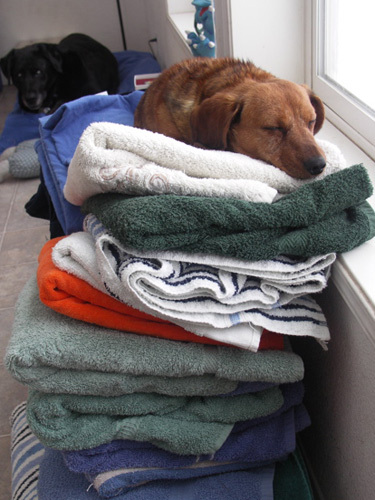 So we’ll pick Callie up and place her on the towel stack. She’ll turn around a few times to get everything ‘just so,’ then lay down for her snooze. We’ll also help her down when she’s done napping. 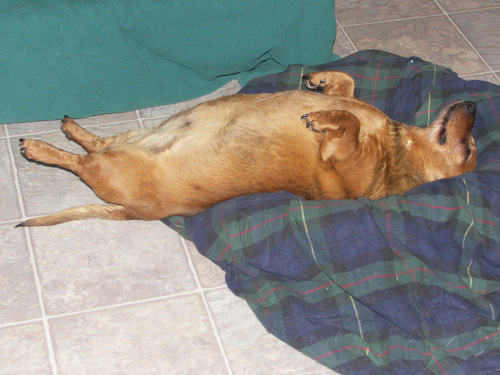 In one of the photos above it may look like there’s an upside-down dead Dachshund, but in fact it’s a very relaxed Callie enjoying one of her many sleeping positions. This is a dog who knows no stress. We think she secretly practices Zen meditation. When we call her to go outside for the last time before bed, she’ll roll over and assume this position, pretending she IS, in fact, dead. But her little tail is wagging, and every time we call her name, her tail wags faster. It’s a dead giveaway, so to speak.